The ITS Project Management Office has pre-configured several reports on Planview data. Information on them is available on the Planview Reporting page. 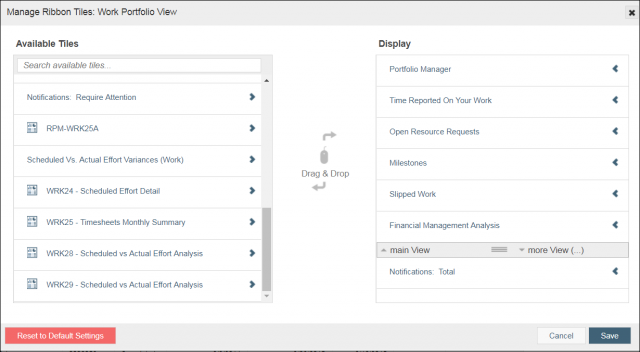 They are available within Planview at the top of the My Planview screen and on the Portfolio View under the Work and Resources menus. If they are missing, follow these steps to add them to your toolbar. Select Manage from the more... drop-down list. Drag the report to the Display column. Note: You can also click Reset to Default Settings and the reports will appear on your toolbar.